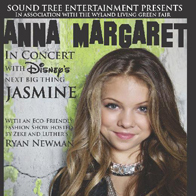 Helping to “recycle some fun” while sharing the “living green” message with their fans…Sound Tree Entertainment brings Disney Channel and Radio Disney stars Anna Margaret, Jasmine Sagginario, and Ryan Newman to “Rock for the Planet” with performances at the upcoming 2010 Wyland Living Green Fair. Newman will open the show with her debut song “Be Original” that encourages kids to stay themselves and is up for voting on Radio Disney. In addition, Disney Radio’s “Next Best Thing” winner Jasmine Sagginario — whose hit songs include “Make a Movie”, “The Next Me”, and “Boy Crazy” — will be the opening act for the Anna Margaret concert. Anna Margaret will perform from pop to her inspirational ballads “I Can” and “Heal Us All” which she co-wrote with her mother; the latter, “Heal Us All” was chosen by the Governor of Louisiana as the theme song for the Gulf Oil Relief program with a portion of funds being donated to the cause. She will also be performing her latest single “I Want 2 Go” that was recently chosen as the new theme song for Disney Parks and Resort Summer Nighttastic Campaign. Autograph signing to begin at 1 p.m.; Eco-friendly fashion show hosted by Ryan Newman and her kick-off performance at 2:30 p.m.; Jasmine Sagginario opens the show at 4:30 p.m. followed by Anna Margaret. HOW MUCH: Tickets are $12 with a portion of the proceeds to benefit the Wyland Foundation. To purchase concert tickets on line visit www.livinggreenfair.com. For continuous news updates on the Wyland Living Green Fair, visit www.livinggreenfair.com, follow the fair on twitter/green_fair, friend the fair on Facebook, email inquiries to info@livinggreenfair.com or call 561-241-7309.